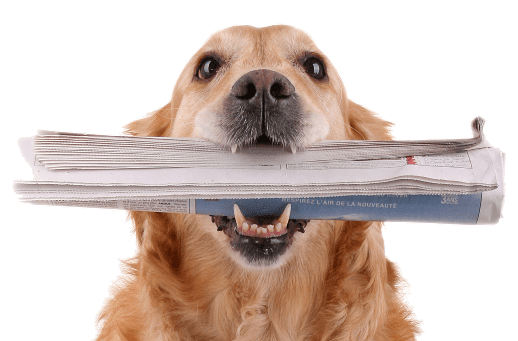 Hip dysplasia, despite years of screening and selection pressure, is still a significant issue in dogs. Recently we had a lovely young Border Collie called Millie in with bilateral hip dysplasia. Radiographs confirmed that both hip joints had laxity, therefore a diagnosis of juvenile hip dysplasia was confirmed. The surgical treatment options for juvenile hip dysplasia are designed to either improve the shape of the joint or if changes are already severe, replace the joint. 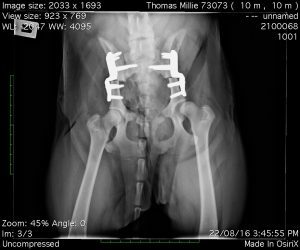 In Millie’s case, the degenerative changes were not severe and a preventative procedure called a double pelvic osteotomy (DPO) can be performed. A DPO is a new procedure that makes two incisions in the bone permitting rotation of the cup of the hip to create a better shape for the joint in the future. The benefit of a DPO versus a TPO (triple pelvic osteotomy) is that the morbidity of the surgery is much decreased. Millie made a great recovery from surgery and is improving all the time. Below are the radiographs taken immediately after surgery. You can see that the pelvis has been cut and a special angled plate used to hold the cup of a pelvis in a new position.